As part of the customer lifetime value calculation, it is necessary to calculate the annual profit contribution of the average customer (or selected market segment). This information should be relatively consistent with the overall corporate financial statements. This is because profitability is delivered through customers. A possible financial ratio that may be already been calculated for the organization is the profit contribution (also referred to as gross margin or gross profit – profits before fixed costs) divided by the number of active customers. This provides an approximate figure of average profit per customer. This could be used as a surrogate data source of customer profitability when calculating customer lifetime value on a simple basis. 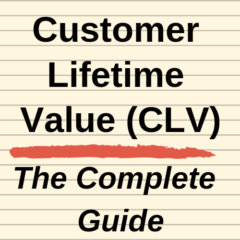 The reality is that unless the calculation/s of customer lifetime value is relatively close to the top-level profitability of the firm, that the CLV calculations cannot be accepted as reasonable accurate and a good indicator of customer profitability. You should be able to state with reasonable confidence that the average annual customer profit (used as part of the customer lifetime value calculations) align with the formal financial accounts of the firm. For example, if you determine that the annual profit contribution generated by an average customer is $1,000 and your firm has around 10,000 customers – then you should expect that the firm’s gross margin (profit before fixed expenses) would be somewhere around the $10m mark. It would be unrealistic to expect an exact reconciliation, but the two numbers should generally be in the same ballpark. If there are significant differences, then the inputs to the customer lifetime value calculation must either contain omissions or elements of double counting. In other words, the comparison to the financial accounts provides an excellent opportunity to check and confirm the accuracy of the customer lifetime value calculation. It is always a good idea when using marketing metrics to double check the analysis against other points of reference. Unfortunately, in a number of companies, marketers are not always considered to be strong in analytical skills – so a strong connection to the overall financial accounts will help reinforce their accuracy and help them to be adopted by management as a key marketing metric to help demonstrate and model the effectiveness of the marketing function.